When I'm visiting my grandparents in London, every Sunday brings the promise of a traditional English roast: chicken, greens, Yorkshire puddings, gravy, and roast potatoes. To be honest, I don't know exactly how to make my grandmother's roast potatoes, but observational evidence would suggest that it involves smothering them with disgusting amount of grease. First, start boiling some water on the stove. As it's heating up, skin your potatoes and cut them into egg-sized pieces. Toss them in the boiling water and cook for 8 minutes. When you strain the water from potatoes, they will be a bit softer but still not fully cooked. At this point, grab a baking tin with high sides (i.e., not a baking sheet) that has enough surface area to fit all of the potatoes spread out individually, but not too much more. Pour in enough olive oil so it is about a quarter inch deep in the pan, then set the oven to 300 degrees, and then throw it in to warm up. 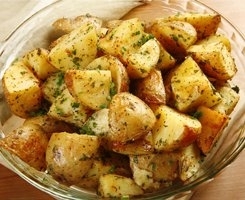 As the oven is preheating, take your boiled potatoes, grab a fork, and score the sides gently. This step is unnecessary if you are really lazy, bit it will make the skin on the potatoes a lot more delicious when all is said and done. Once the potatoes are prepped, throw them in a bowl and cover with a healthy does of salt, pepper, thyme, rosemary, and paprika. Toss them around so they get a coating of spice. Finally, pull out the tray of olive oil and arrange the potatoes so they're all in direct contact with the oil. Cook for about 20 minutes. Then turn them all over and cook for another 20 minutes, or until they are as crispy as you like. You are now a nouvelle British champion!